Once again, I have fallen way behind in my reviews. Thanks to Moviepass which my wife and I both have now, we have been watching films at a breakneck pace. I'll quickly sum up some the recent movies I've seen and then dive deeper into Episode 8 in the Star Wars saga. Rian Johnson has been given the reigns of the new Disney money-making machine. It was recently reported that the Looper/Breaking Bad auteur is signed on to develop a new Star Wars trilogy that sits outside of the Skywalker story of Episodes 1-9. In a prequel to this new endeavor, Johnson has delivered an entertaining and original take on the Star Wars franchise with Star Wars: The Last Jedi. Without giving anything away plot-wise, the movie focuses on our favorite characters from JJ Abrams' The Force Awakens (Luke Skywalker, Princess Leia, Rey, Finn, BB-8, Kylo Ren, Poe Dameron) and spreads them out across the galaxy on various adventures. Luke, Rey and Kylo in particular have monumental scenes that change the shape of the story arc of this saga. Johnson is adept at bringing inventive battle scenes, rewarding cinematic sequences and a whole lot of humor to the table. As a whole, The Last Jedi is more fun than Episode 7 and while I still enjoyed Rogue One better, it is a worthy addition to the franchise that answers some questions and ends up adding more. There are several decisions that writer/director Rian Johnson has made with this film that worked really well for me, while others I could have done without. I really liked the decision to kill off Supreme Leader Snoke. Kylo Ren's desire to become the big baddie of the franchise seemed like the wise move, and his amazing lightsaber battle with Rey in Snoke's chamber was a gorgeously shot piece of film. Seeing Rey and Kylo communicate through a force connection brought those two characters closer together and after they decided to part ways again after the chamber battle, you can totally tell Adam Driver gives his all to the performance. Watching him hunt after Luke in the Battle of Crait, you can really feel his anger and desperation. It's like watching a problem child spin out of control. Driver has turned Ren into one of the more memorable movie villains in recent memory. On the flip side, Mark Hamill totally owns his elderly Luke Skywalker performance. Nuanced, funny and touching at times, he is able to bring elements of the past to life in a new way. I've always wanted to see Master Luke in a role similar to Obi-Wan in A New Hope and we got just that in this film. I'm not sure how I feel about how Johnson chose to have Luke die as he was giving a force-projection, but the move paid off as it brought us those epic climactic battle scenes between Luke and Kylo. It was also a nice touch to see Yoda come back as a force ghost, voiced once again by the legendary Frank Oz. While a lot of this movie I thoroughly enjoyed, I did not really care for some of the excess cutesy stuff. I did like the Porgs but the horse-type creatures and the subsequent chase to get off Canto Bight (the casino planet) seemed a bit forced and over the top. BB8 driving an AT-AT was a bit much too and a re-hash of Chewy in Return of the Jedi. I wanted to see Finn sacrifice himself to destroy the cannon at the end of the film and didn't like the choice to have Rose save him. In fact, the whole Rose/Finn/Benicio Del Toro side-plot didn't work for me. The worst moment of this movie, however, was when Princess Leia got sucked out of a spaceship and all of a sudden starts flying/floating through space because of the force. That scene seemed so out of place, ridiculous and forced. Despite these flaws, Johnson really delivered visually with this movie. 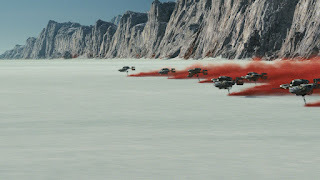 The Battle of Crait itself is a sheer marvel of set design and cinematography. Watching the white surface explode in red lines and dust clouds was a wonder to behold as an audience member. The epic, silent flash-explosion of Laura Dern's character's spaceship smashing into a Star Destroyer was stunning. ILM did a great job of ramping up the CGI in this movie and helping deliver Johnson's grand vision. Last Jedi has brought a lot of negative disturbances in the force lately. Several Reddit users have been up in arms about the choices Johnson has made (some of which I outline above). I am not one of those people. I feel Johnson had free reign to make his decisions and they were made to move beyond the Skywalker soaked plot line. I'm excited to see how JJ Abrams finishes this trilogy (think General Poe Dameron) and look forward to enjoying Johnson's own trilogy down the line. This movie was very entertaining to me and I'm glad I got to see it on opening night with all my kids. The Last Jedi falls short of a perfect rating but is slightly better than Episode 7 and gets 4.5 out of 5 JRs from me. Kudos to Rian Johnson, one of the better directors working today who has earned the keys to the George Lucas' franchise.